tobaccoasia 53 • Double your resource value • Use 100% expanded fine- cut for MYO and RYO • Untouchable product quality • Impex – pressure/vacuum technology • DIET - Dry Ice Expansion Technology AircoDIET has supplied more than 55 DIET plants worldwide, many of which have been turn-key. We continuously develop and refine the DIET process and our DIET plants have above 95% uptime with a dry yield better than 98.5% through the plant. www.aircodiet.com Over 100% tobacco expansion a strong flavor, they can choose to rotate it. The promotional slogans of this Pride configuration that has adopted this innovative technology are "rotation at will", "one cigarette, two flavors", and "fine in flavor and interesting in smoking". Changing the colors, forms, etc. of filter rods Besides such a form of interactive innovation meant to encourage participation by consumers, what has been more frequently adopted in China is perceptual innovation. Namely, by changing the colors, forms, etc., of filter rods, they intend to make smokers remember the distinctive characteristics of their cigarette products at first sight. For example, in doing so, they have designed or developed filter rods with a smiley face. As far as filter rods with a smiley face are concerned, they have on the cross-section of them three light red arcs against the white background depicting two curved eyes and the mouth with the corners turned up, which is meant to portray a feeling of in- definite coziness and pleasantness. Whenever they open a cigarette packet, consumers will immediately see 20 smiling faces in it. Behind such a seemingly simple design are numerous technological procedures. In reality, the wrapper of the filter rods with a smiley face is made of two natural tex- tile fibers and a groove plug paper planted into a cellulose acetate filter rod. The two functional lines make the eyes of the smiling face while the mouth-shaped arc paper made of sarcandra glabra (an herb native to southeast Asia) cellulose make the corners of the mouth on the smiley face. Such a delicate technology combination creates the smiley face design on the cross-section of the filter rods while improving the quality of the cigarettes. The natural textile fibers planted into the filter rods can not only be a carrier of fluid additives, but can also directly filter and absorb tar or other harmful substances in smoke. 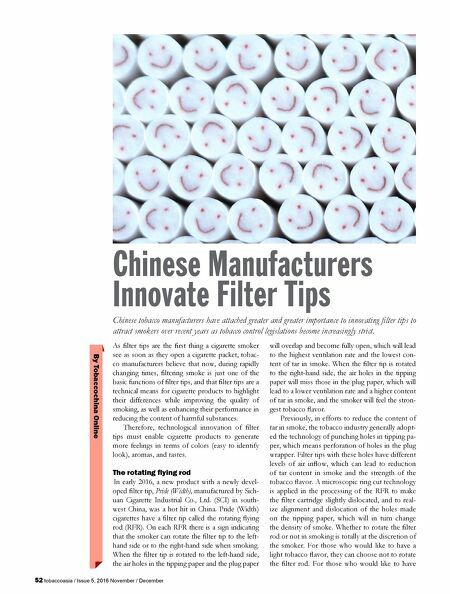 The smiley face filter rods are a new type of cigarette filter tip with the creativity, look, and device all being unprecedented in China and the rest of the world. These filter rods are a new product with the intellectual property rights wholly owned by San- lian Cigarette Materials Co., Ltd. in southwest China's Sichuan Province. The company has also been granted international patents to the product. The technology for produc- ing such filter rods has later been applied in the production of another cigarette in the Pride brand by SCI – Pride (Red New Concept), whose vivid look and unique functions have drawn strong reactions from markets in both China and internationally. Cigarette plug paper making machinery manufacturers including the GD of Italy and Hauni Maschinenbau GmbH of Germany have sent delegations to visit China and expressed the wish to jointly develop plug paper manufacturing equipment as a result. Filter rods with spice lines The design of new filter rods with a new look and consumer interaction is not the only matter that resonates with smokers. 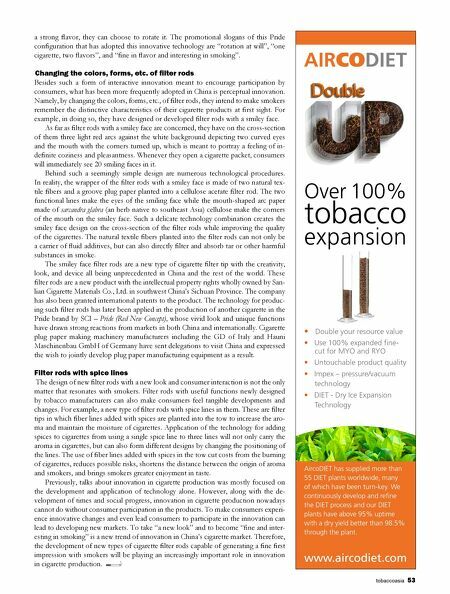 Filter rods with useful functions newly designed by tobacco manufacturers can also make consumers feel tangible developments and changes. For example, a new type of filter rods with spice lines in them. These are filter tips in which fiber lines added with spices are planted into the tow to increase the aro- ma and maintain the moisture of cigarettes. Application of the technology for adding spices to cigarettes from using a single spice line to three lines will not only carry the aroma in cigarettes, but can also form different designs by changing the positioning of the lines. The use of fiber lines added with spices in the tow cut costs from the burning of cigarettes, reduces possible risks, shortens the distance between the origin of aroma and smokers, and brings smokers greater enjoyment in taste. Previously, talks about innovation in cigarette production was mostly focused on the development and application of technology alone. However, along with the de- velopment of times and social progress, innovation in cigarette production nowadays cannot do without consumer participation in the products. To make consumers experi- ence innovative changes and even lead consumers to participate in the innovation can lead to developing new markets. To take "a new look" and to become "fine and inter- esting in smoking" is a new trend of innovation in China's cigarette market. Therefore, the development of new types of cigarette filter rods capable of generating a fine first impression with smokers will be playing an increasingly important role in innovation in cigarette production.